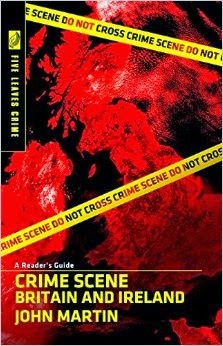 A review copy of John Martin's Crime Scene Britain and Ireland: A Reader's Guide arrived this morning. It's available to buy now and from a quick flick (at the East Anglia section naturally), is the sort of book I would love to have written, sigh, but at least the Euro Crime website gets a credit. This book is for all readers of crime fiction. Dividing Britain and Ireland into twelve regions, the author describes the work of contemporary and historic crime writers and their novels where the setting of the novel is crucial, giving the story context and local relevance. While regional crime novels go back to The Hound of the Baskervilles, identifiably regional crime within specific cityscapes and landscapes only came into its own twenty years ago with Ian Rankin, John Harvey and Val McDermid. Their work, together with hundreds of others, and thousands of titles are described in this volume which will be essential for the serious crime reader. Great writers of crime fiction not only create memorable detective heroes, they also firmly establish them in a setting. The home counties town of "King's Markham", for example, is the perfect "patch" for Ruth Rendell's Inspector Wexford and Ellis Peter's Brother Cadfael is as inseparable from the cloisters of medieval Shrewsbury as John Harvey's D.I. Resnick is from the mean streets of modern Nottingham. Addicts of the British detective story should enjoy this gazetteer. With it in their hands they can navigate the streets and alleyways of Edinburgh where Sherlock Holmes sprang to life in Conan Doyle's imagination and where Ian Rankin's Inspector Rebus now tracks down villainy (and a dram or two). They can explore the desolate coast of East Anglia, a favoured venue for P.D. James' Adam Dagliesh and the home of Margery Allingham, who also set many of the adventures of her enigmatic Albert Campion amid the Essex marshlands. In Oxford, they can tread in the footsteps of Inspector Morse or pay homage at the site where, in "Gaudy Night", Dorothy Sayers' Lord Peter Wimsey embraced - at long last - his Harriet Vane. The many black and white and colour photographs evoke the atmosphere and history of these and many other settings with which hundreds of thousands of readers will already be familiar in their imaginations. Based on interviews with leading writers and extensive research, and fuelled by the authors' enthusiasm for Britain's most popular literary form, this book should be an interesting read for all crime addicts.